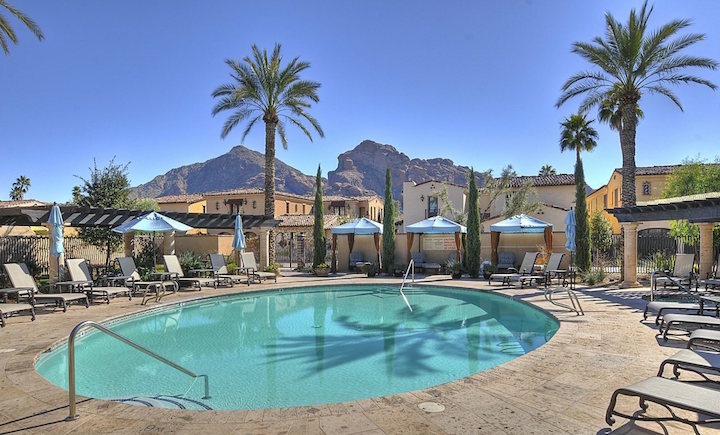 Montelucia is located in the affluent city of Paradise Valley. On the resort property of Montelucia is La Posada,L a 24 hour, guard-gated community with strict access for residents and their guest only along with an additional 30 security cameras to keep residents safe. Montelucia offers stunning views of Camelback Mountain and is centrally located of the SE corner of the intersection of N. Tatum Blvd. & E Lincoln Drive. Montelucia is a one of a kind, stress free luxury living with 5 star amenities offering; concierge and room service, private chefs, pool privileges at Montelucia Resort (as well as a pool just for the residents) and a 20% discount on food and beverages. Basically "your wish is their command" at Montelucia with fine dining, hiking trails, and more just outside your door. Below are the latest listings for sale in Montelucia. Our Russ Lyon Sotheby's Real Estate experts can guide you through the homes currently for sale and help with your search for the perfect home in Paradise Valley. To set up a private tour of any home you see here contact us at; 888-316-4622.